(5) Strong Industry Group is preferred. These stocks are statistically likely to outperform. 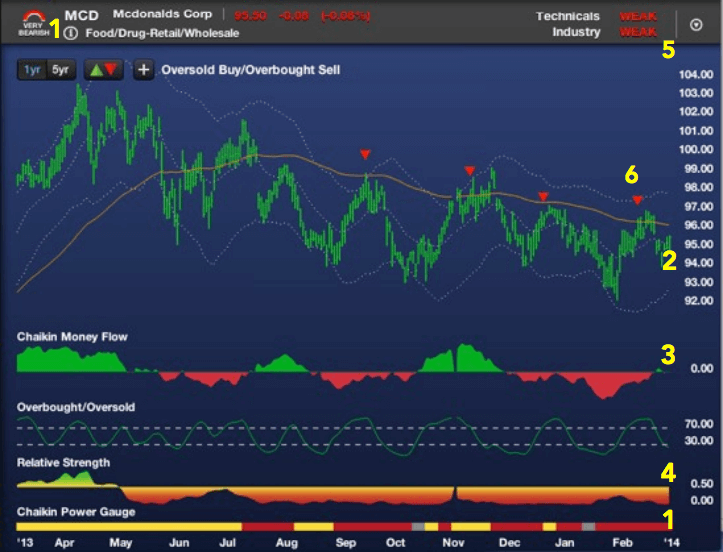 Look for oversold pullbacks to a support level, or other Buy Signals (6), as low-risk buy opportunities. (5) Weak Industry Group is preferred. These stocks are statistically likely to underperform. Look for overbought rallies to a resistance level, or other Sell Signals (6), as low-risk short opportunities. These may happen in any order. 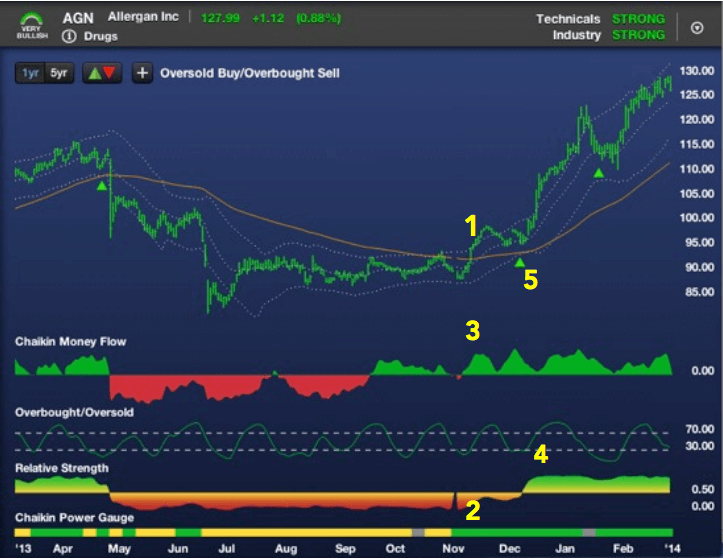 (5) Oversold Buys or other Buy Signals after the Turnaround is solidified can be very strong entry points. These stocks offer opportunities to get in earlier in an intermediate-term move. The earlier in the move, the higher the risk that the turnaround is not complete yet. Consider a stoploss a few percent below the 200-day DEMA (long-term trend). 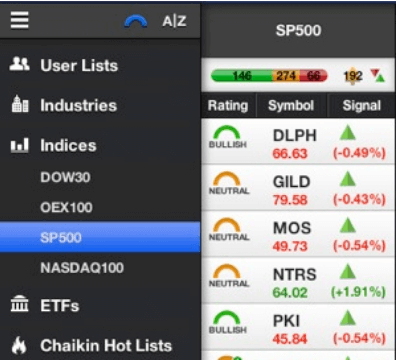 To find ETFs with Signals, select ETFs — Top 100 from Chaikin Hotlists, then sort by Signal in the Watchlist. 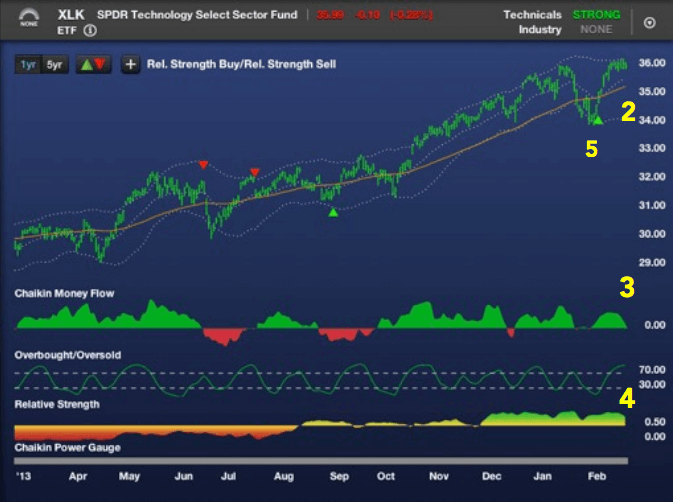 Before buying a Sector or Industry ETF, compare it to the others in its Category. ETFs are sorted Strong to Weak in the List Navigator, ranked by constituent Ratings. Start with a desired list. If small, arrow through all Very Bullish, all Bullish if possible. Confirm chart technicals. If list is large, sort by Signal. Arrow through all Buys. Confirm technicals. If too many Signals, Filter By Signal. 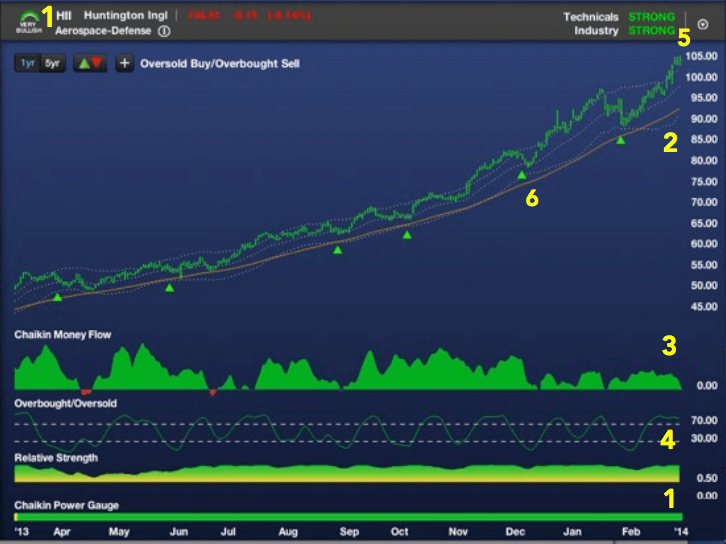 Start with Oversold Buys and Relative Strength Buys. Arrow through stocks, confirm technicals. “All Signals” has all stocks triggering any Signal today and may be a large list.